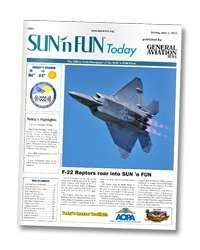 SUN ‘n FUN Today is the official daily newspaper of the SUN ‘n FUN International Fly-In & Expo. It is distributed throughout the campus, campground and greater Lakeland area hotels each morning during the show. Each issue contains feature stories of the day’s events and news of the prior day, plus details of the days forums, workshops and day/evening programs. It’s the single best source of the “best of that day” at SUN ‘n FUN. A section of each day will also provide coverage of the key after-show features and dining options in the Lakeland area. Available daily (free) throughout the SUN ‘n FUN campus & Lakeland area hotels. Check out the 2019 SUN ‘n FUN Today Digital Editions HERE!